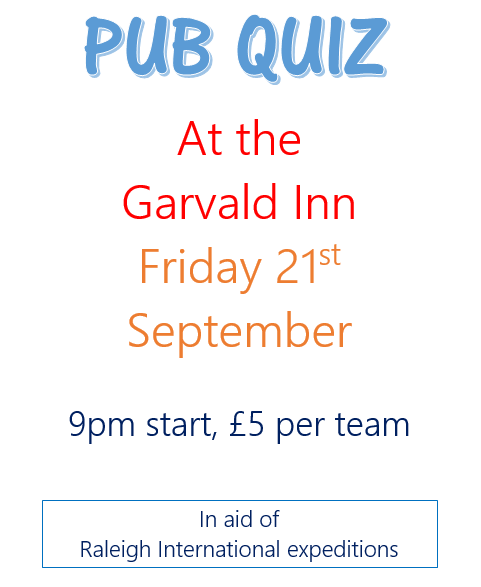 PUB QUIZ AT THE GARVALD INN on Friday, 21st September. £5 per team. The fun starts at 9pm. Garvald’s Conal and Robin are travelling to Costa Rica and Tanzania with Operation Raleigh this autumn to volunteer with Raleigh International. 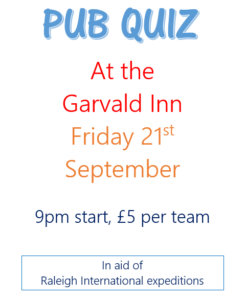 They will be holding a pub quiz on Friday 21st September in the Garvald Inn to raise money for their expeditions. Heads up – there will be some themed questions! This entry was posted in Events on September 14, 2018 by Admin.